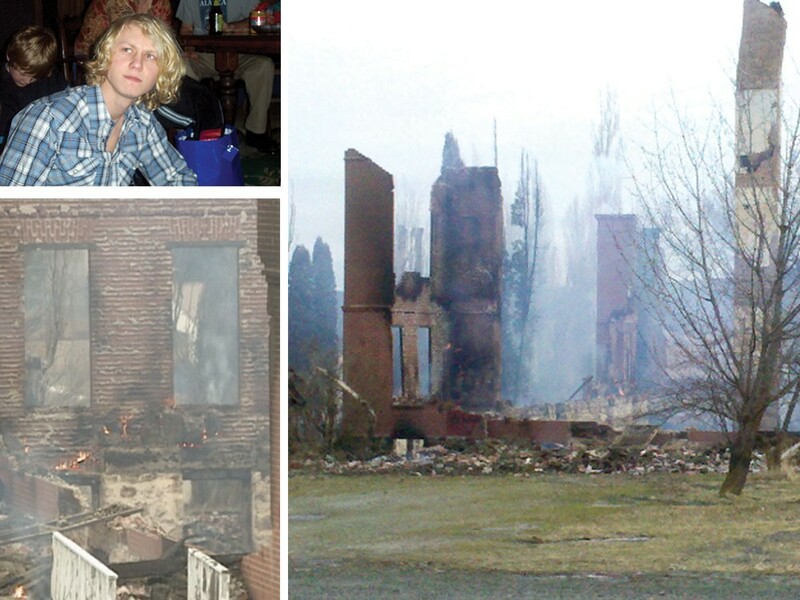 Did a young Sandpoint man die in the Sisters’ Building fire? No one may ever know. It was a strange, bad night at 3:00 in the morning Feb. 3 when the looming, dark husk of the Sisters’ Building erupted into a cyclone of orange flame on the Coeur d’Alene Indian Reservation. The tall brick building was built more than a century ago as a boarding school where Indian children from tribes all over the Northwest were sent to learn English and white ways. As such, it was an uneasy historical marker, entwined with personal and tribal histories. Some saw it as a visible, painful reminder of oppression … others saw it as a godsend, a haven run by nuns. The building touched the lives of many on the rez. Sometimes going back three generations. Fire crews from Tensed, Plummer, Tekoa and as far as St. Maries roared to the fire and battled a limited water supply and low water pressure as much as they did the flames. Twelve hours later, he says, they decided to knock down the brittle walls. But even then, as they sprayed the building down, the bricks exploded with hissing steam. Once the walls collapsed into the basement, the embers burned fiercely for days. “When it burned, we didn’t know anybody was in there,” Abrahamson says. “Every window was boarded up. It looked like there was no way people could get in there … but there were people getting in there. It was four days later when the rubble cooled enough for Abrahamson, tribal police chief Keith Hutcheson and state fire marshal Mike Aamodt to clamber into the foundation. They formed a line and began walking, searching for clues to how the fire started. “I was the one who found them. It was quite a surprise,” Abrahamson says of the distinctly human bones at his feet. “It was a different kind of shape, it seemed out of the ordinary and I called the chief over and said, ‘We may have something going on here.’” The intense heat had consumed the body’s clothing, along with any of its other identifying features. Even the medical examiner in Spokane, where the remains were shipped, was unable to determine whether the body was male or female, modern or ancient. And then a family in Sandpoint called. They were certain it was their son. Daniel Uhnak, a slender 21-year-old with a distinctive mop of white-blond hair, had gone hitchhiking down U.S. Highway 95 on Feb. 2, intending to visit a friend in Moscow. The highway traverses the reservation and bisects all its towns — Worley, Plummer, Desmet. In fact, tribal police made contact with Uhnak in Desmet that day. Since then, nothing. Daniel Uhnak has vanished. Two investigations are running now, one into the cause of the fire and another into the identity of the bones. The FBI has opened a case and has found a lab in Texas that may be able to tease out the identity of the fragile bones. It is a painful and confusing time for the Uhnak family, says a relative who asks not to be named. Uhnak was arrested Jan. 26 on a minor trespassing charge for walking on the long railroad trestle that crosses Lake Pend Oreille south of Sandpoint. After his arrest, his family implored the state to evaluate Uhnak’s mental health, according to records found by the Bonner County Daily Bee. Uhnak had recently exhibited erratic behavior — including starting fires, the records say — but an evaluator with Idaho Health and Welfare determined he did not meet the criteria for persistent mental illness. Uhnak was released from the Bonner County Jail over the objections of family on Jan. 31. He left Sandpoint Feb. 2 and has not been seen or heard from since his contact with tribal police that afternoon. Although the records are public, the family is devastated, the relative says, and is still unable to speak openly about their loss. They said goodbye to Daniel in a memorial service Feb. 12, even though there’s still no definitive proof that Daniel is dead. Daniel Uhnak’s family has filed a missing-persons report with the Ponderay Police. They ask anyone who may have information about him to call the family at 208-597-2739, or the police at 208-265- 4251.